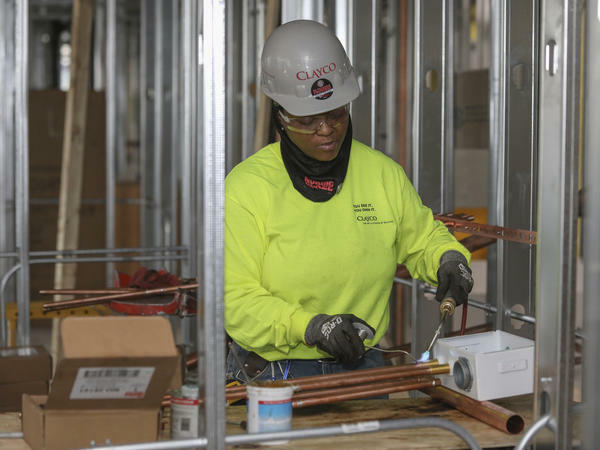 Plumber Zakiyyah Askia welds pipes at a high-rise residence under construction in Chicago on Jan. 24. U.S. employers added 196,000 jobs in March, a rebound from February's weak growth, the Labor Department said Friday. "That number in February was a fluke," said Nariman Behravesh, chief economist at IHS Markit. He says the March figure shows an economy that's still growing, albeit at a slower pace than last year. The report showed modest declines in jobs in retail and manufacturing. "We're talking about an economy that's slowing," said Diane Swonk, chief economist at Grant Thornton. "But for now, it should be another good year, where workers finally get to reap the benefits of a very long marathon of an expansion." The unemployment rate was unchanged in March at 3.8 percent. With unemployment hovering near 50-year lows, forecasters say there's an upper limit on potential job growth. "Businesses are having a hard time finding workers," said Sarah House, a senior economist at Wells Fargo. "If they're not able to fill these positions, that's going to reduce the overall pace of job gains as well." A growing number of new hires are people who had left the workforce altogether but were drawn back by the surge in job openings and wages that are growing more than 3 percent per year. "The fact that we're seeing wage growth accelerate, that's helped pull more workers into the labor force," House said. "While wages are picking up, maybe they're not picking up quite as fast as they would be otherwise because those additional workers are coming in." Average hourly wages in March were up 3.2 percent from a year ago. That has been a boon for business and helped to keep inflation in check. "One of the complaints we hear all the time from our customers is a shortage of workers," Behravesh said. "If, in fact, what this extremely low unemployment rate is doing is encouraging people who had given up or who weren't that interested in looking for a job to come back into the labor force, that does mean that we can continue going down this path before wage inflation and eventually price inflation take off."